Children will learn why both the Royal Navy and the Merchant Navy fleets were so important to keep the nation fed 100 years ago, through handling these attractive replica food items. During the First World War 60% of the nation’s food was imported from other countries across the world, especially from the British Empire. 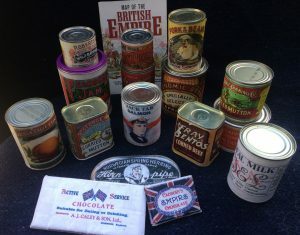 This resources enables the children to discover where in the world a range of World War One replica labelled tinned and packet food came from and to have some idea of the long and dangerous journeys taken by the ships to bring the food to the British people in a time of war. And how they were protected by the British Navy.